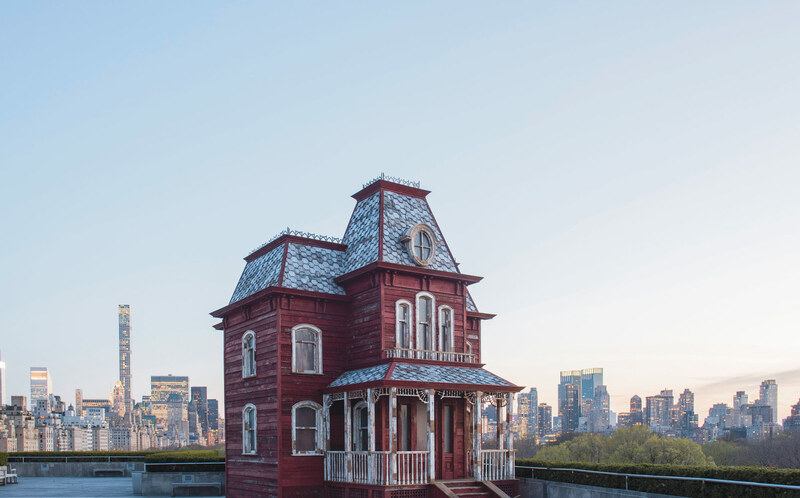 Installation view of The Roof Garden Commission: Cornelia Parker, Transitional Object (PsychoBarn) at The Metropolitan Museum of Art, 2016. Photographed by Alex Fradkin, Photo courtesy the artist. 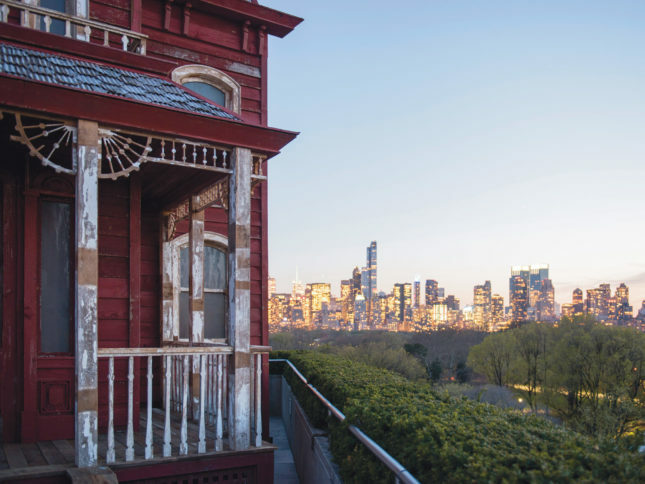 Looming in a corner on the rooftop of the Metropolitan Museum of Art in New York is a new structure that looks like it’s been there forever: its mansard roof tattered, its blood-red siding weather-beaten, its porch crumbling. It looks haunted. It looks familiar. It looks like—it is—the house from Psycho. Cue the theme music, right? Well, no. Under the bright-blue sky of a perfect spring day, with Central Park stretching out in every direction, it looks a lot less menacing than it does in Alfred Hitchcock’s thriller. Actually, it seems pretty harmless. But so did Norman Bates. 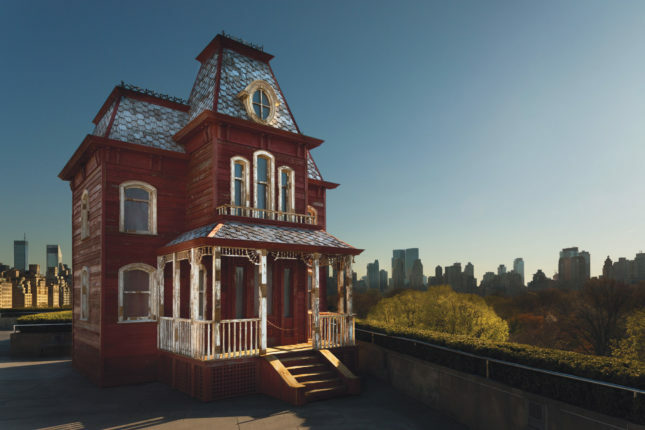 Installation view of The Roof Garden Commission: Cornelia Parker, Transitional Object (PsychoBarn) at The Metropolitan Museum of Art, 2016. Photography by Hyla Skopitz, The Photograph Studio, The Metropolitan Museum of Art. Copyright 2016. The tree-house-sized installation, Transitional Object (Psychobarn), was created by Turner Prize–winning artist Cornelia Parker, who has previously used architectural fragments in her work to explore themes of memory, transition, and transformation. Psychobarn plays with our preconceptions, and its menacing exterior belies a surprisingly wholesome origin. Daunted by the skyline, Parker decided to create a small domestic structure to contrast the city’s glass and stone towers. Looking to Edward Hopper’s paintings for inspiration, she found her answer after learning that his 1925 House by the Railroad was the model for the iconic Bates residence in Hitchcock’s masterpiece. To re-create the house while cultivating tension between the familiar and the unfamiliar, Parker used repurposed wood and rusted metal salvaged from an old red barn slated for demolition. She built her house like Hitchcock built his: A stage set that looks whole only from the right perspective. The metal scaffold behind its facade is clearly visible from half of the rooftop. Like its cinematic inspiration, Transitional Object (Psychobarn) is part fiction and part reality. Hopper, Hitchcock, barns, Cornelia Parker, stage sets—I love all those things, which makes it all the more frustrating that I don’t love Psychobarn. The work’s title is a reference to psychoanalytical theory related to the emergence of a child’s identity independent from his parents. Perhaps it’s appropriate then that Psychobarn struggles to separate itself from a rich artistic heritage. It’s clever, I guess. Funny, even. But it doesn’t quite transcend the role of pop-culture punch line to become something greater, something that offers more profound insight, which Parker is certainly capable of producing. She first came to my attention with her pieces Mass and Anti-Mass—two nearly identical, large black cubes composed of charred wood fragments suspended at each end of a large gallery space—Mass is the remains of a church that burned down after a chance lightning strike; Anti-Mass is a church that was burned down by arsonists. It’s a challenging and provocative piece that I still think about often. Psychobarn has none of that power or complexity. There is no hidden psychosis. 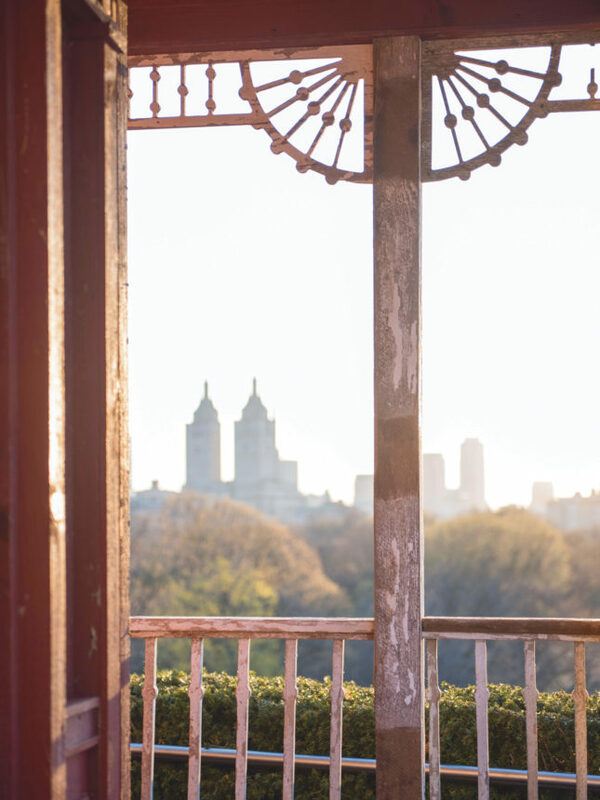 I’m not saying that I need to have a deep emotional experience on the Met rooftop. This is, after all, a summertime installation that’s only 50 feet from a bar. It should be fun, and it is. But previous Met rooftop installations managed to be fun while also transforming our perception of the roof, the museum, or even the entire city. Dan Graham and Günther Vogt’s phenomenal Hedge Two-Way Mirror Walkabout (2014) and Tomás Saraceno’s Cloud City (2012) come to mind. These interactive installations distorted, refracted, and re-presented the skyline to the rooftop revelers at the Met. 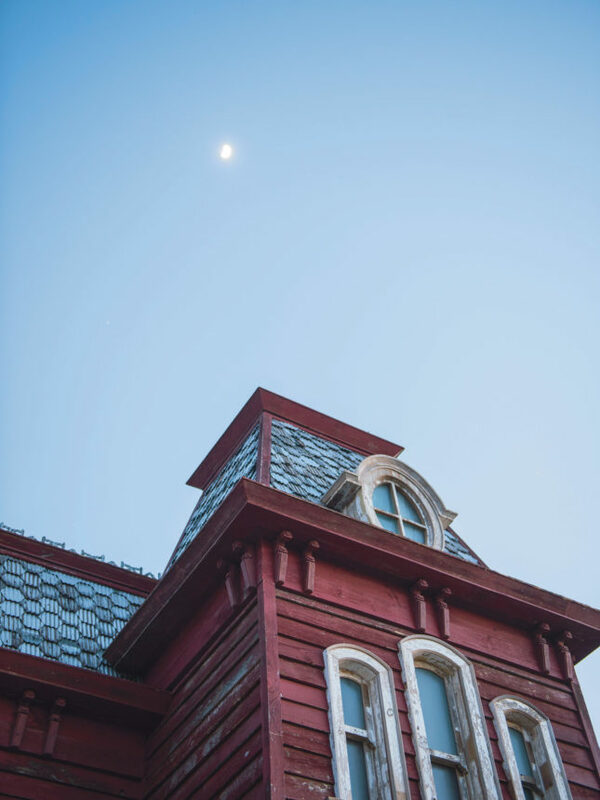 Psychobarn aims for a similar populist appeal (and it will surely capture hundreds of likes on Instagram), but unlike those previous projects, it doesn’t need to be experienced to be appreciated. It gains nothing by being on the Met’s rooftop. Worse, the rooftop gains nothing by having it. Originally, Parker wanted to build an entire barn on the roof. That would have been a transformative experience. Imagine stepping out of the refined galleries of the city’s greatest fine arts museum into a dirty, hay-filled, chicken-clucking space. Alas, it proved unfeasible. Don’t let this deter you from making a pilgrimage up to the Met rooftop this summer. There is that aforementioned bar up there that, for the duration of the installation, will be serving Hitchcock-themed drinks. I recommend the Corpse Reviver (gin, Cointreau, Lillet, and absinthe). Like any good cocktail, the thoughtful blend of ingredients results in something that’s more than the sum of its parts. I just wish I could say the same for the art. Transitional Object (Psychobarn) is on view through October 31 at the Metropolitan Museum of Art.